You have to pass the CCBA exam to receive the certification from IIBA. To increase the effectiveness of your study and make you familiar with the actual exam pattern, we have prepared this sample questions. 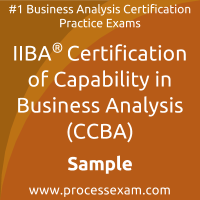 Our Sample IIBA Certification of Capability in Business Analysis Practice Exam will give you more insight about both the type and the difficulty level of the questions on the IIBA CCBA exam. However, we are strongly recommending practice with our Premium IIBA Certification of Capability in Business Analysis Practice Exam to achieve the best score in your actual IIBA CCBA Exam. The premium practice exam questions are more comprehensive, exam oriented, scenario-based and exact match of IIBA Certification of Capability in Business Analysis exam questions. 01. A company has been using an application for several years but one component still involves manual data entry. A project is started to automate this function that will impact several different business units. What is the business analyst's (BA) first step in the project? 02. Project Communication Management includes the processes required to ________. a) Organize, manage, and lead the project team. b) Identify, define, combine, unify, and coordinate the various processes and project management activities with the Project Management Process Groups. c) Manage timely completion of the project. d) Ensure timely and appropriate generation, collection, distribution, storage, retrieval, and ultimate disposition of project information. 03. A business analyst (BA) defined the future state for a financial organization that aligns with the overarching vision. What is an example of a business objective contained in the organization's future state? 04. Before requirements can actually be approved to be managed, what must be true about the requirements? a) Requirements must support the solution scope. b) Requirements are governed by the requirements management plan. c) Requirements must support the requirements management plan. d) Requirements must be approved by the technical review board. 05. The first draft of the requirements specification has been completed by the business analyst (BA), and is now ready for review by stakeholders to ensure requirements and designs have been defined correctly. What technique will ensure requirements have been identified correctly? 06. A business analyst (BA) was eliciting requirements for a machine's functionality from a stakeholder. The stakeholder tried to explain the steps in the process and how it is performed. Despite repeated attempts, the BA could not comprehend the process. Which of the following techniques would help the BA understand the requirements? 07. There are three inputs in the plan business analysis approach. Which one of the following is not one of the three inputs? 08. The process of defining the business need uses one output. What is it? 09. A company is developing a public web site for hotel reservations and assigns two business analysts (BAs) to the project. The first BA focuses on the requirements for the “Login” feature and the second BA focuses on requirements for “Registration” feature. Which of the following describes the traceability relationship between the requirements owned by the second BA and the requirements owned by the first BA? 10. Which one of the following statements best describes a business analysis methodology? a) It is the conformance to requirements and a fitness for use. b) It is a complete set of action, processes, and output to collect, analyze, and prioritize the project requirements. c) It specifies team roles, deliverables, analysis techniques, and the timing and frequency of stakeholder interactions. d) It is a formalized and repeatable business analysis approach.